You may be thinking that having a minuscule bathroom means that you can’t have a bathtub to sink yourself into and soak the day’s stresses away after a long day but you couldn’t be more wrong. In fact, here are some awesome small bathtubs that are sized just right for your small bathroom. If you buy bathtubs like this then you will want them to last as long as possible. You can make them last a long time by keeping up maintenance on them and getting someone to refinish the tub for you. Go onto the website of your local handyman to see if he can do that for you! We love these tubs and think you will too. So, go ahead and get inspired. Remodeling your bathroom could be a hard task to undertake, so it helps to look around for a bathtub (from somewhere similar to https://www.tileredi.com/shower-pans-and-bases/bathtub-replacement-brands) that could suit you and your style. Granted, this tiny bathtub means that you can’t lie horizontally in it for a full length soak, but you can fit in it in a sitting position. It makes up for its shortage in length by making it higher than an average bathtub. Plus, the gilded exterior and claw-foot finish adds a certain luxurious charm to your bathroom. Because you have limited floor space, the only way to go is up. Which means this circular stainless steel bathtub is perfect for you, as you get to enjoy a relaxing soak without sacrificing premium real estate in your bathroom. The quintessential bathtub that you normally see in older homes is done on a smaller scale here, to fit into your less roomy bathroom. But it still looks gorgeous and is a fully functional bathtub that you can use. If you have a nice little corner in your bathroom then by all means, use it for cute little bathtub and enjoy a good soak in it. This bathtub comes in a striking red colour that is sure to make your bathroom look even more charming. Take some tips from the Japanese and invest in a circular soaking tub for your cosy bathroom. This one comes in an antique copper colour and is miniature sized so that you still have ample space in your bathroom. The general consensus for a small bathtub is that instead of making it long, one should get a round one instead, as that takes up less space in your bathroom. This simple bathtub is great if your existing bathroom’s decor is showy enough and you want it to be unobtrusively in the background. Bathtubs can come in many different kinds of materials and if you have a bathroom that is full of modern furnishings, get one in an acrylic material to fit in with your bathroom’s decor. If you are tired of all the usual bathtub shapes out there, then this unconventionally shaped bathtub will be the one that fits your needs. While still allowing you to indulge in a good long soak, the quirky shape means that you will never get bored of the design. 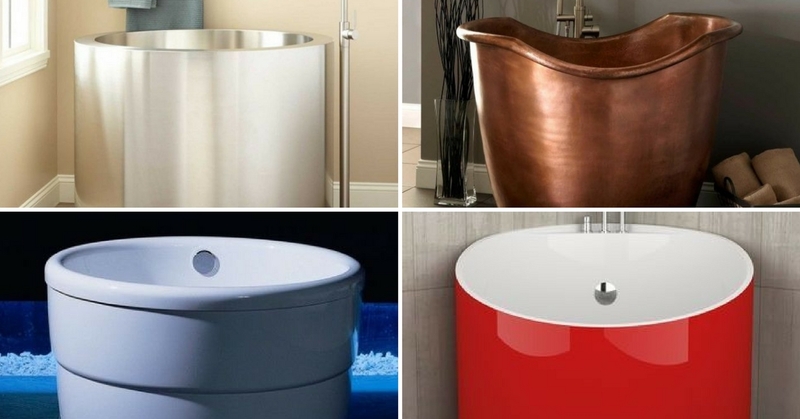 Want to make your bathtub a truly outstanding statement piece? Then get this square bathtub that will be the star of the show in your bathroom. Don’t worry, you can still have your soak in this cool bathtub.